Rishworthians defended well and showed excellent attacking flair but succumbed to a bigger, heavier Middlesbrough pack as they lost 29-14 at Copley. At the break it was anybody’s game after a thrilling end to end first half but in the second period the visitors turned on the power. With a long injury list and other players absent, Rishworthians called in replacements from their strong Development squad. The Sutcliffe brothers, Kurt and Luke, were drafted in for the first time this season and provided some creativity in midfield. In the forwards, teenagers Ethan Pollard and James McHugh played in the second row and flanker Toby Muscat-Baron was outstanding. While totally outgunned in the second half, the whole pack defended brilliantly on their own line. 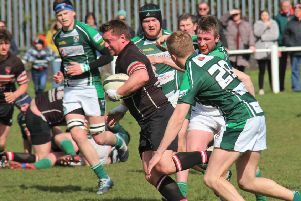 It could not have started better for Rishworthians and a flowing move ended with flanker Chris Flanagan touching down in the corner. Josh Kelly added the conversion with a fine kick. Middlesbrough hit back strongly and reduced the arrears with a penalty before their outstanding left wing Rhys Kilbride showed searing pace to burst through for a converted try. The home men continued to take the game to the visitors and right wing Doug Heseltine gathered the ball well and set up another attack with Luke Sutcliffe almost getting in. They continued the pressure and after skipper Fraser Swarbrooke charged down an attempted clearance the ball was recovered and Kurt Sutcliffe ghosted through to score. Kelly added the conversion. Back came Middlesbrough and right wing Andy Micklewright squeezed in at the corner for an unconverted try. The last act of the half saw Kelly hit a post with a long range penalty and Rishworthians went in trailing 14-15. Middlesbrough started the second half keeping the ball tight in the forwards and it finally paid off with a converted pushover try. While Rishworthians had to defend for much of the half, they looked dangerous with the ball in their hands and almost got back on the scoresheet with a flowing move which saw Swarbrooke and Stone linking well with the backs before busy teenage scrum half George Wright almost got Heseltine in at the corner. The visitors’ forward power began to show again but Rishworthians continued to defend well. The continuous pick and go attempts were eventually successful with a converted Middlesbrough try. The home men ended the game strongly and although defeated they came off the pitch satisfied with a much-improved display against one of the division’s top teams.